Heart Feathers danglers give you the free sprited vibes with lots of nomadic.. This delicate floral metal earring are made for very classy and subtle lookI.. Suitable for any occasion be it in festival, parties or get-together with fr..
Nomadic love dazzles dangler is your next best friend, as to team up with any outfitBe it with denim..
Heart Feathers danglers give you the free sprited vibes with the pure white ..
Addicted to you Tassel earring consists of gold plated drop with tassels han.. Suitable for any occasion be it in festival, parties or get-together with friends .. 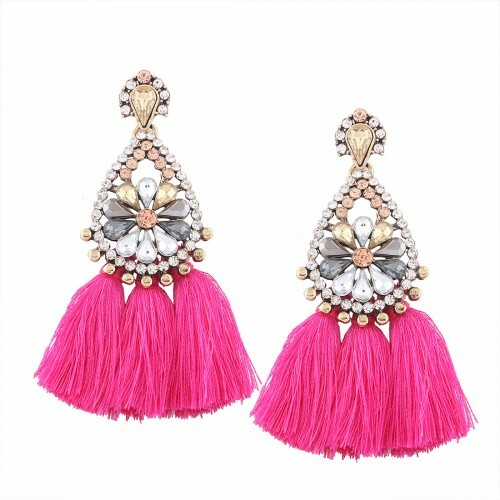 Happening Bohemian Tassel earring consists of gold plated drop with tassels.. I like my way earring consists of gold plated drop with tassels hanging on i..